Comment: Withdraw to Fairmonitor from Gunbit Technology LTD.
GB Investment +5.5 Received Payment 5.5 USD from account U18106798. Memo: API Payment. 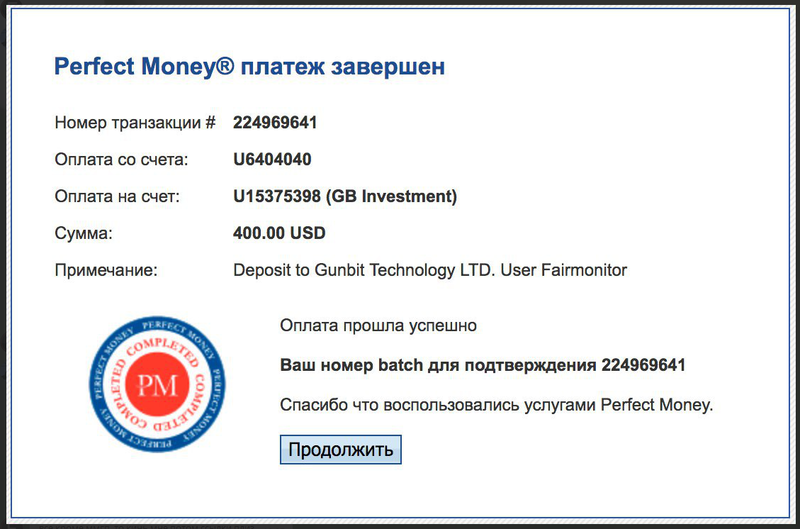 Withdraw to Fairmonitor from Gunbit Technology LTD.
GB Investment +4.2 Received Payment 4.2 USD from account U18106798. Memo: API Payment. Withdraw to Fairmonitor from Gunbit Technology LTD.
21.08.18 06:43 Transfer Sent Payment: 200.00 USD to account U16191771 from U1294xxx. Batch: 225365623. Memo: Shopping Cart Payment. Deposit to Gunbit Technology LTD. User allhyips. 22.08.18 19:34;Account;Receive;Received Payment 5.00 USD from account U18106798 to account U1294000. Batch: 225540617. Memo: API Payment. Withdraw to allhyips from Gunbit Technology LTD.
Gunbit Investment - gunbit.tech +4.7 Received Payment 4.7 USD from account U18106798. Memo: API Payment. Withdraw to Fairmonitor from Gunbit Technology LTD.
23.08.18 19:34;Account;Receive;Received Payment 4.00 USD from account U18106798 to account U1294000. Batch: 225645461. Memo: API Payment. Withdraw to allhyips from Gunbit Technology LTD.
26.08.18 10:11;Account;Receive;Received Payment 5.00 USD from account U18106798 to account U1294000. Batch: 225886472. Memo: API Payment. Withdraw to allhyips from Gunbit Technology LTD.
25.08.18 09:51;Account;Receive;Received Payment 4.00 USD from account U18106798 to account U1294000. Batch: 225797530. Memo: API Payment. Withdraw to allhyips from Gunbit Technology LTD.
27.08.18 10:52;Account;Receive;Received Payment 4.00 USD from account U18106798 to account U1294000. Batch: 225984924. Memo: API Payment. Withdraw to allhyips from Gunbit Technology LTD.
28.08.18 19:55;Account;Receive;Received Payment 2.00 USD from account U18106798 to account U1294000. Batch: 226153873. Memo: API Payment. Withdraw to allhyips from Gunbit Technology LTD.
28.08.18 10:53;Account;Receive;Received Payment 6.00 USD from account U18106798 to account U1294000. Batch: 226096872. Memo: API Payment. Withdraw to allhyips from Gunbit Technology LTD.